The compiler book(The dragon book) explains that value types are created on the stack, and reference types are created on the heap. More about Java run-time data areas. What I don't understand is that since JVM is essentially a software, how are those JVM heap, stack and threads mapped to physical machine? I would appreciate it if someone can compare those concept between Java and C++. Because Java runs on JVM, but C++ does not. Comparing with Java, What does C++ run-time data area look like? A picture would be helpful, I can't find a good picture like the JVM one above. 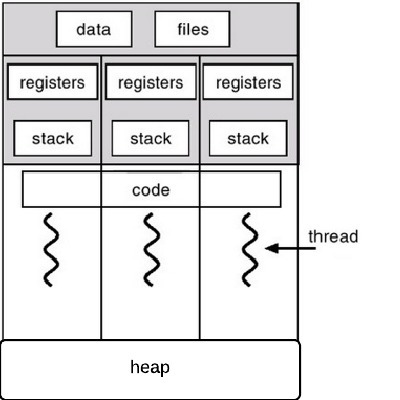 How the JVM heap, stack, registers and threads are mapped to operating system? or I should ask how they are mapped to physical machine? Update: I draw a picture for runtime physical memory of a process. The heap is a pre-allocated continuous region of virtual memory. e.g. void* heap = malloc(Xmx); // get the maximum size. void* stack = malloc(Xss); // get the maximum stack size. Native threads are OS features which are not part of the JVM space as such. Because Java runs on JVM, but C++ does not. C++ still needs a runtime environment and libraries to start up. Try deleting your C++ Runtime or libc and these won't start. Comparing with Java, What does C++ run-time data area look like? There is one large region of virtual memory you can use. There isn't a picture because it wouldn't tell you much. Imagine one long rectangle labelled user space. Again there is no magic. 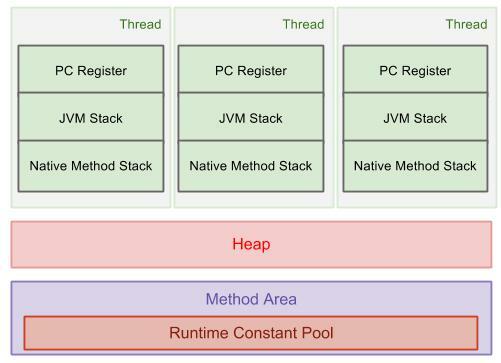 The JVM heap is a region of memory, a JVM stack is the same a native stack which is what C+ uses, the JVM's registers is the same as native registers which is what C+ uses and JVMs thread are actually native threads which is what C+ uses. I think you are assuming there is more magic or obscurity going on than there is. Instead you should assume that the simplest, efficient and lightweight design has been used and you won't be far off. I should ask how they are mapped to physical machine? Not the answer you're looking for? Browse other questions tagged java c++ memory jvm runtime or ask your own question. How to analyze a java thread dump? What is the Mapping Of Java Stack with Native memory. How many types of stack are there in a running JVM program? In HotSpot JVM, how do you make more memory available to thread stacks?